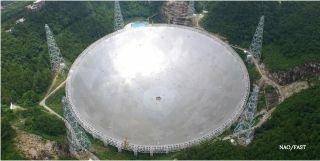 This photo shows the 500-meter Aperture Spherical Telescope in southwest China's Guizhou Province. "The QTT's scientific mission is ambitious," said Doug Vakoch, president of METI International, an organization that looks to organize the efforts of both searching for and sending out messages to whatever life might be out in the universe. "Recent history shows us that when a radio telescope with radically enhanced characteristics comes online, we make remarkable discoveries." China is already the home to the world's largest radio telescope. The FAST, or Five-hundred-meter Aperture Spherical radio Telescope, has been in operation since 2016 and was built in a natural depression in the landscape, similar to the famous Arecibo Telescope in Puerto Rico, and therefore is primarily a fixed position dish. It has, however, a novel, "active surface" design, where metal panels on the surface can be tilted to change the focus to different areas of the sky. "FAST's shape-shifting surface can point to a limited extent, but it's restricted to about 40 degrees of zenith — the point in the celestial sphere that is directly overhead," Vakoch explained to Seeker. "In contrast, the QTT should be able to pinpoint stars located in three-quarters of the night sky. That means the QTT can examine parts of the heavens that will be forever out of the view of FAST." Vakoch said QTT, proposed to be built in the Xinjiang autonomous region of northwest China, will have a slightly larger aperture than the two largest, fully steerable radio telescopes currently in operation. The Robert C. Byrd Green Bank Telescope (GBT) located in Green Bank, West Virginia is currently the largest steerable radio telescope, with an elliptical dish that's 100 meters by 110 meters. Germany's Effelsberg dish is 100 meters in diameter. "The QTT will be only slightly larger, with a diameter of 110 meters in all directions," Vakoch said. "But we all know how a little added width to a pizza can make a big difference in the number of slices we get from it. So, too, with radio telescopes: A few additional meters of dish size can nudge up your sensitivity, letting you observe fainter astronomical objects." Vakoch said QTT will be able to increase the search for pulsars — the dense, rotating stars that act as cosmic clocks, emitting pulses with remarkable regularity. The QTT may also have the capability to detect gravitational waves from pairs of massive black holes, thanks to its ability to precisely measure the tiny changes of the pulsing rates of pulsars as the gravitational waves pass by. "By scanning along the radio dial, astronomers will use the QTT to look for the signatures of complex organic molecules in interstellar space,"he said. "These interstellar surveys will show how widely the basic building blocks of life are distributed throughout the cosmos." "While naturally occurring radio signals are slightly spread out at their characteristic location on the radio dial," Vakoch explained, "SETI scientists look for much narrower, artificially produced spikes that leap out as distinctive techno-signatures, unlike anything found in the interstellar medium or in other stars or galaxies." "A cross-national coordination of data also helps insure the integrity of the data," Vockoch said. "If construction of the QTT remains on schedule, we could start analyzing the instrument's first data in five years." Vakoch said there's never a guarantee that any large-scale telescope project will be completed, and history is full of examples of long delays and budget overruns. But he's very optimistic about QTT's future, with China's history of completing milestones in astronomy, as well as human and robotic space exploration. "China has a strong record of completing ambitious scientific projects in astronomy and space exploration," Vakoch said. "Given this track record, we have every reason to be optimistic that the QTT will be completed."